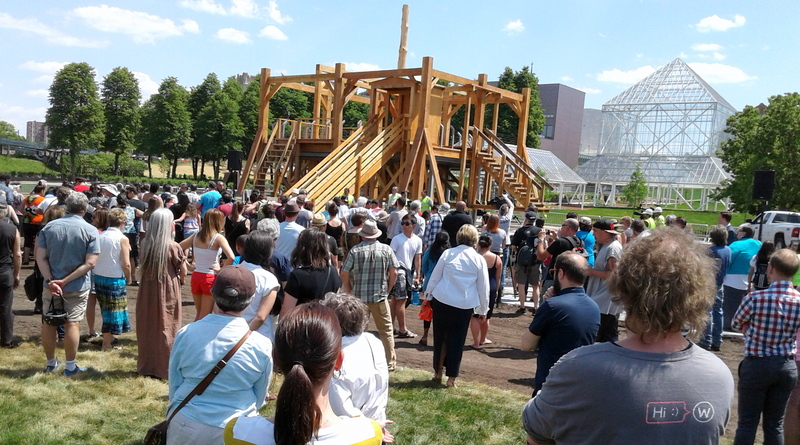 A crowd gathered for a Dakota healing ceremony to deconstruct Scaffold June 2. The Walker Sculpture Garden reopened on Saturday, an event delayed by protests over the controversial new work Scaffold which ultimately was removed. U.S. Sen. Amy Klobuchar spoke at the Grand Reopening and talked about Scaffold, according to a Star Tribune story. A commentary on capital punishment, Scaffold’s prominent feature replicated the giant 1862 gallows used to hang 38 Dakota men all at once, following the Dakota-U.S. War. Neither the artist nor the Walker thought to engage the Dakota community around the work, one of the worst moments in their nation’s history and the largest mass execution in U.S. history. Institution and artist have apologized and had the sculpture removed, never to be rebuilt. Comment: The Star Tribune story also said: “The reopening had been pushed back a week after American Indian leaders protested the inclusion of ‘Scaffold’ …” That’s true, but incomplete. There were many non-Native people who found the sculpture inappropriate, too. That helped pressure the Walker to act. It is important to remember this is not just an “American Indian” issue. Indian Country Today ran a June 9 story titled: Will President Trump Eliminate the BIA? The Bureau of Indian Affairs (BIA) funding has been on the decline in recent years and Trump’s plan continues that trend, the story said. The president’s plan allocates $2.5 billion for Indian affairs—a $370 million reduction for the BIA and Bureau of Indian Education (BIE) alone. Yet there are more federally recognized tribes (567) than ever before, all with divergent needs, it said. Indian Country doesn’t know yet how the Department of the Interior might try to “reorganize” the BIA, but it is worried and watching.